It’s that time of year: out with the old, in with the new. The used sofa and easy chair we bought when we moved into our current abode nearly two years ago have long since worn out their welcome, and we had been on a steadily intensifying search for something that would elevate our standard of living from merely functional. A tour around the city’s few home furnishings emporia (most of which are owned and operated by the same parent company) was not very encouraging. Since we don’t own a home and still have small children, we weren’t willing to shell out the big bucks, which meant that we would still be paying too much for a compromise on style and/or comfort. It always seems that when you’ve exhausted all apparent options, the magic starts to happen. Once we had decided not to plonk down the dough on something new but mediocre, we turned our attention back to Craigslist. That very day, we saw a dubious-looking but maybe passable couch for a decent price. Made the call, still available. Turned out to be located in the condo we used to live in. Too easy. Somehow the sofa looked much better in real life than it did in the photo. How often does that happen? If only there was a companion to replace our easy chair. 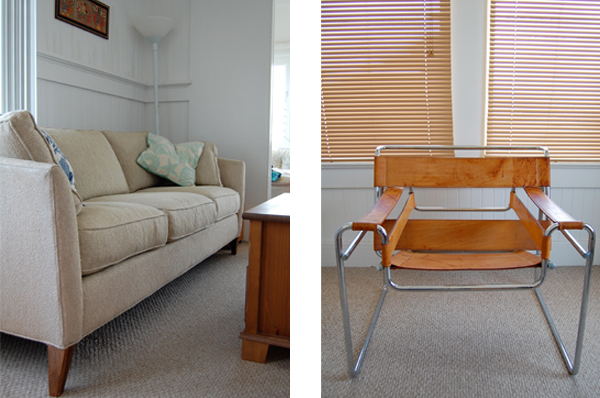 There in the corner… a couple Wassily Chairs. Are you… selling them? Yes, again for a bargain. Our living room is now graced by a very good condition McCreary Modern sofa, and the Wassily is commanding a massive presence in the study. The leather straps on the Wassily need some work – they’ve got some sort of water damage, hence the bargain price. All things considered, they’ve set a new precedent in our household. Out with the old, in with the new.